Long ago and far away (okay, so my office downstairs wasn’t really that far away), I started blogging just to have a place to keep up with our field trips. Then I added a few rants. This was long before Facebook. (Now I post short rants there and long rants on my blog.) After a few years, I discovered I could get free books just for reviewing them. I love to read, I’m opinionated, and “free” is my favorite price. It was perfect! At first, I was only reviewing books from publisher review programs, and had no contact with the authors. I posted a review of Here Burns My Candle by Liz Curtis Higgs, a book I had received from a review program, and was thrilled to get an email from her publicist asking if I’d like a copy of the sequel, Mine Is the Night, to review. Well, of course I said yes. I was even more thrilled when the book arrived, because it was in a box with five other books from the publisher! This review thing was just getting good. Eventually I stumbled onto Authors.com, and World Literary Cafe (at the time, it was still Women’s Literary Cafe), and Adopt An Indie, which is now The Indie Exchange. Suddenly, I was dealing directly with the authors, and that was so much fun! Now if something about the book confused me, or there was a serious issue with the grammar or the plot (not often, but it does happen) I could email the author directly (and politely) so they could either straighten me out or correct the book, whichever was necessary. Now The Indie Exchange Facebook group for authors, bloggers, and readers has become my third online home. (This blog is the first, a super-secret unschool/prayer group is the second.) The authors there are great to work with. Many of my reviews these days are more to help a friend than to get a free book. Don’t worry. My reviews are still honest. I only pick books that sound interesting to me. It just so happens that my friends are fabulous writers. The bloggers there are like a little family. We have our own little group in which we can ask anything and several people will jump in with help, advice, and encouragement. Or a button or two. That group is where I met Kriss, aka Cabin Goddess, who just happens to be the one who designed not only the cool I Support Indie Authors button on my sidebar, but also the Celebrating Womanhood button. Reviewing and blogging have led me to some of my favorite authors, whom I probably would never have encountered otherwise. Jonathan Gould, Jeremy Rodden, Karen Pokras Toz, Benjamin Wallace, and Jacquie Rogers are just a few of the fabulous authors that I’ve been thrilled to “meet” and read over the past year. During the past year, I’ve worked with several great book bloggers, including Kathy at I Am A Reader, Not A Writer. While setting up the Celebrating Womanhood event, I had the help of several great blogging friends, and I’ve encountered many more great women in the blogging world while promoting the event. When I first started blogging, and even when I first started reviewing, I could never have envisioned the friendships I would gain and the sense of community that both authors and bloggers have. It’s been a blast and I can’t wait to see what comes next! 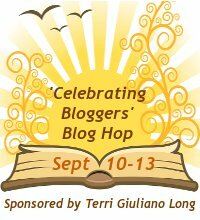 The Celebrating Bloggers Blog Hop is sponsored by Terri Giuliano Long. You can still join in until September 13, so head on over and sign up! This entry was posted in Blogging and tagged authors, bloggers, Celebrating Blog Hop, fun, reviews, writing by Amanda Beaty. Bookmark the permalink.